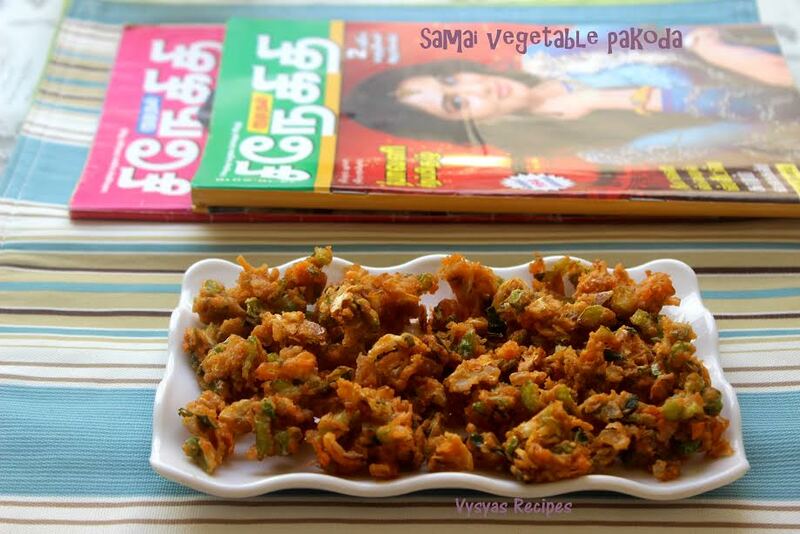 Samai Vegetable Pakoda is a Crispy,Crunchy fritters Recipe made with Millets flour, besan flour & Vegetables. It is an apt tea time snack. Little millet known as saamai in Tamil,Kutki in Hindi,saame in Kannada,Sama in Telugu & chama in Malayalam is a wonderful millet which is suitable for people of all age groups.you can make this pakoda with barnyard Millet flour or kodo Millet flour also. Serves : 4 - 5. Samai flour - 1/2 cup. Chilli Powder - 1 + 1/2 tsp. Finely Chop Carrot,Beans,Cabbage,Capsicum,Onion,Curry leaves,Green Chilly & Coriander leaves. Take a Mixing Bowl add Samai flour, besan flour, Chilli Powder, finely Chopped Carrot,beans,cabbage,Capsicum,Onion, Curry leaves & Coriander leaves.Sprinkle needed salt & Mix well to make a dry Mixture. Then sprinkle water little by little to make a tight dough, as Shown in the Picture. Mixture must be tight, if Soggy it absorbs more oil & you won't get crispy Pakoda's. Heat the oil,if you feel the oil is hot, drop small Portion of dough into hot oil. if it raises immediately, it is an indication that oil is hot, else heat the oil for few minutes till it is hot. When oil is hot, keep the flame to medium, then crumble the dough into oil, as you wish in a form of fritters. Deep fry it, until it turns Golden brown colour on both the sides. When it cools down, store it in a air tight container. you can make this Pakoda using Kodo Millet Flour & Barnyard Millet flour also. you can add handful of Chopped Cauliflower. you can finely chop methi leaves & add to flour. you can add 1/4 tsp of fennel seeds to the flour. Always make the dough tight by sprinkling water to get cripsy Pakoda's.